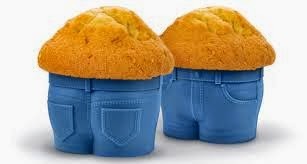 When you button your waistband and have excess fat hanging off the waistband, this is known as a muffin top. Because a muffin top is excess body fat, you must engage in calorie-burning activities to burn fat. Although targeting exactly where you will lose fat is impossible, you can combine cardiovascular exercises with muscle-toning ones to reveal toned muscles when you do lose abdominal fat. Interval training can help you jump-start your weight loss, helping you lose body fat and get rid of your muffin top. Perform this exercise while doing your cardiovascular exercise of choice -- from walking to biking to jogging. Start by warming up and stretching for five minutes, then perform your exercise at a vigorous pace -- about a level 7 of exertion on a scale of 1 to 10 for one minute. Switch to a slower pace for two minutes, then continue to alternate for between 20 and 30 minutes. Cool down for five minutes. Perform this routine at least three times per week. The double-leg stretch is a Pilates move that tones the midsection, particularly the deep abdominal muscles. When your lose fat, this can help tone your muffin top. Start by lying on your back and pulling your knees toward your chest. Place your hands behind your head and take a deep breath in. As you breathe out, straighten your legs in the air and lift your head and shoulders off the ground. Hold this position for two seconds, then lower your shoulders back to the floor and bend the knees toward your chest. Repeat the exercise between eight and 10 times. The walking lunges with twist exercise tones the midsection and gets your heart rate going, which helps you burn more calories. You can perform this exercise holding a medium-weight dumbbell -- between 5 and 8 lbs. -- or without a weight. Hold the dumbbell in front of you at shoulder height. Lunge forward with your left foot, keeping the left knee from going over the ankle. In the lunge position, twist to your left side, then face forward again. Step forward with your right foot, then repeat to lead with the right foot, twisting to the right side. Continue alternating legs for 12 repetitions. Rest for 30 seconds, then perform two additional sets. Ab lean-backs target the deep abdominal muscles and the lower back muscles, helping to tone these muffin-top areas. Start by sitting on the floor with your legs slightly bent and only your heels on the ground. Hold your arms in front of you, lifting them to head height. You can hold a medium weight to increase the exercise’s intensity. Keeping your back straight, lean back slightly. You should feel the stomach and back muscles working. Hold this position for 10 seconds, then lift up to your starting position. Repeat the exercise eight times.